... Again she proves to be able to penetrate the soul of a song, of which most are gathered from far and near. Artfully she maneuvers between tradition and avant-garde sound eruptions, in virtuoso musicianship with her fixed ensemble, supported by the inventive arrangements of accordionist and qunun player Kostas Vomvolos. 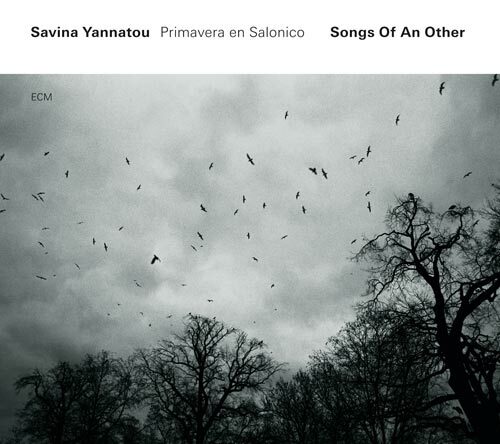 …The Greek singer Savina Yannatou is no folk interpreter in the narrow sense of the word. She has mastered the art of interpretation, full of expression she endows the forms with life, slips into roles and changes these with as little effort as she does switch the languages and vocal techniques she has made her own. Above all: she experiments. Beginning from traditional vocal styles, she explores the field of free improvisation. Her ensemble Primavera en Salonico is recruited from jazz experienced instrumentalists and improvisation experienced folk musicians, and thus do interpretation and improvisation, tradition and experiment come equally into their right with Yannatou as they seldom do. Even if not in one and the same song. Moreover does the program divide into two groups: here songs arranged with care by accordionist Kostas Vomvolos, interpreted comparatively “traditionally”, there collective improvisations on the basis of Greek folk songs. The first are enchanting, the latter are the sensation. A kind of “free style world music” with clear African sounds.